Looking for a great primary school in Bundoora? 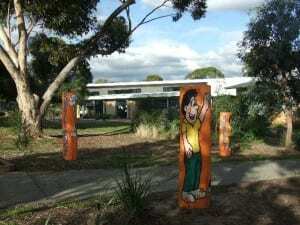 Bundoora Primary School is situated in the residential suburb of Bundoora, in the north-east of Melbourne. Our school is surrounded by Gresswell Forest, established areas, the adjacent Bundoora Secondary College campus, Strathallan Golf Course and the new Gresswell Grange Estate. We are close to La Trobe University, RMIT Bundoora and the Metropolitan Ring Road. Bundoora Primary School’s enrolment currently stands at 285, with students from a variety of backgrounds, demonstrating the multi cultural aspect of our school. Our Specialist Programs consist of Visual Arts, Performing Arts, LOTE (Language Other than English), Physical Education and a dedicated Science/STEM Program. We target advanced learning through our streamed numeracy and literacy groups, in order to ensure students are learning at their acquired ability, which leads to improved students’ skills. An English as an Additional Language (EAL) program operates throughout the school and provides opportunities for students to have further focused instruction in English. We also operate a Reading Recovery program for students who require extra support. At Bundoora Primary School, each child’s individuality is recognised and celebrated. Our teaching staff are caring professionals who work collaboratively and are passionate about providing the very best learning environment for each and every student. We have high expectations of our students in all areas of their learning and behaviour. Our teachers have an extremely rigorous approach to assessing and monitoring our students’ learning, which shows in our excellent Statewide data that demonstrates our dedication to support students to improve their skills. We are focussed on ensuring each student is taught at their point of need and our teachers make frequent adjustments to their teaching and learning programs to suit individual needs. We are also very proud to be a KidsMatter School, seeking to nurture happy and balanced children. Our school boasts a caring, community environment where all families can feel that they are a part of something special. Please visit our KidsMatter page to find out more about the initiative and our own KidsMatter journey. We provide extra assistants in our classrooms, through our Education Support Officers. They offer individual and small group learning support throughout the school. Our Education Support Officers provide literacy and numeracy support across the school to those students who have English as a second language or who have specific learning needs. Our Social Enterprise Program has become an initiative our students and staff are extremely proud of, giving our students, from Prep to Year 6, the opportunity to support various charities and people in need, while gaining knowledge and confidence in basic business processes.Please visit our Social Enterprise Program page for more information. Our school also provides an array of extra curricula activities, including a well developed Student Leadership Program, Breakfast Club, Lunchtime Clubs, individual music lessons, a variety of sports activities and links with sporting organisations. We also boast the Bundoora Primary School House System which promotes a sense of belonging and pride and provides students with fun activities, throughout the year, to gain points for their House. We have a very successful Out of School Hours Care program which runs every morning and afternoon, as well as on pupil free days. Our popular Breakfast Club provides yummy nutritional food for those hungry tummies, allowing our students (and parents) to further socialise each morning to gain confidence . At Bundoora Primary School, we award Scholarships of Excellence Awards to students who demonstrate exemplary effort and excellence in relation to one or more of our school values: respect, excellence, resilience, cooperation and friendship. The monetary component of the scholarship is put towards supporting each recipient’s education. The awards are announced at the end of each school year. We are very proud of what we do here at Bundoora Primary School.